In September 2007, Blake Henke, managing partner of North Star Science and Technology, saw McCain’s presentation on BJDP at a Wildlife Society meeting in Tucson, AZ. In the meeting McCain stated he wanted to radio collar a jaguar named Macho B. Henke met McCain after his presentation and offered to donate a GPS radio collar to the cause including tracking software, airtime for the collar, and access to the technicians at North Star. McCain accepted his generous offer. 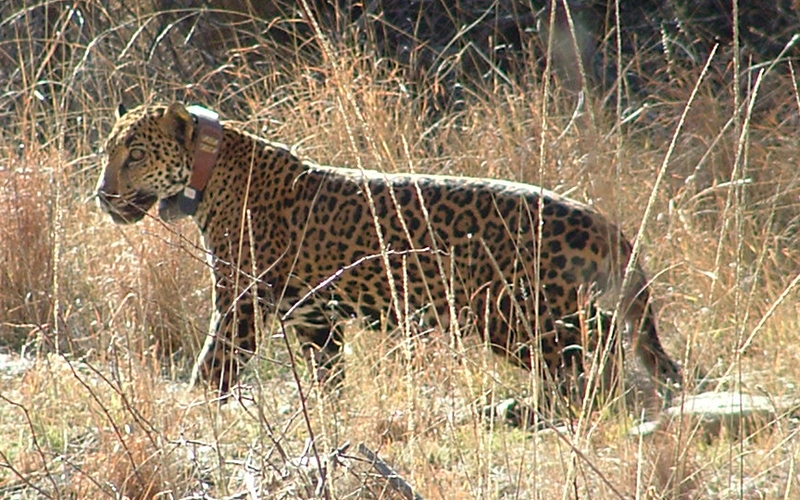 When McCain joined the AZGFD lion and bear snaring project he brought the donated jaguar collar with him. After Macho B was euthanized the collar was returned to McCain. He, in turn, took it with him to the Yucatan two months later for a jaguar project his snaring “boss” Ron Thompson was involved with. Macho B’s collar was attached to a late addition to the project, a young female jaguar. She was apparently drugged three times in a twenty-four hour period before her release; first for dental surgery, second after escaping her enclosure after surgery, and three, for her release in front of media into a place where she had never been (a hard release) that already had a stable population of jaguars (See blog roll for Peter Emily Foundation and AZ Daily Star articles about project. The second jag mentioned was killed months later by locals). McCain and others from the field team found the young jaguar, dead, ten days after her release without a noticeable mark on her. They left her as she lay minus Macho B’s collar. Below is Macho B with the donated collar at his capture site.